According to Wikipedia, Sorkin (born 1961) grew up in the posh Westchester suburb of Scarsdale. His father was a lawyer, his mother a school teacher. His paternal grandfather was a founder of the ILGWU, one of the most successful and militant of the early trade unions. Sorkin attended Syracuse University, known for its theater and cinema program. 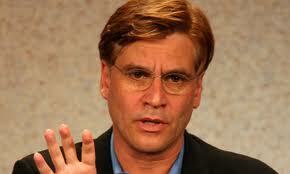 It should not surprise us that Sorkin is widely known as a left-liberal, and a progressive. Or that his own love life has been unstable, perhaps complicated by drug use. I watch his shows because he writes about the change in the workplace where powerful women are now present; they are sometimes smarter than the men who supervise them, and the males accept this revolutionary change apparently devoid of sexist angst. Moreover all his characters wield great power, as US heads of state with their staffs, or, as in this case, an outspoken cable news anchor whose memory bank and ability to think encyclopedically on his feet, in the anchor chair, and under the klieg lights, is simply astounding. Sorkin’s main character in The Newsroom is a moderate Republican, ostentatiously centrist, who is equally critical of the Occupy Wall Street ‘mob’ as he is of the ‘Taliban’-like far Right. I don’t know if Sorkin’s father was a progressive Republican, or whether “Will McAvoy” is positioned simply to draw in the maximum numbers of eyeballs. But the carping criticism from the media regarding the “preachiness” of season two is bizarre. As I have tried to demonstrate, “the moderate men” are amoral, and must be so, in order to buttress the notion of the neutral state. (See https://clarespark.com/2010/11/06/moderate-men-falling-down/, especially the bold-face type that quotes from Melville’s The Confidence-Man (1857). 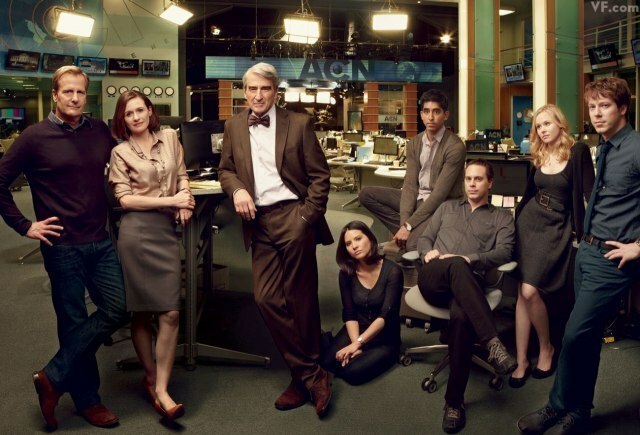 But more interesting than that (and ignored by the reviews I have read), is that startling season finale where Sorkin makes it clear that it is necessary to move on in the journalism business, and to overcome the traumas of the day. “Maggie” (played by Alison Pill) will not make in the biz, for she does not have the required short memory and thick skin of her colleagues. (An abandoned, hysterical Magdalene?) she clicks her mouse and the rest is darkness. In one of his more interesting post-episode summaries, Aaron Sorkin tells the viewer that he has been thinking about his own relation to the audience. (Will’s father has just died as he learns through a phone call to his ailing father, but his sister conveys the unexpected news via cell phone. Live on the air Will is tongue-tied, then says “It’s just us now.” A nice Oedipal moment, as Will will later win the heart of his “executive producer”, i.e., the reconnection with the didactic, perhaps debating Mother, now that Father has left the scene. As with most other television offerings, that is the correct question: what designs do fiction writers have on the audience? And how do they envision their audiences? Do the better writers even know how to think about such a question? How much poking around all the relevant families of origin would able reviewers have to accomplish before writing their analyses of successful writers like Aaron Sorkin? Or is Sorkin caught in that no-man’s land where he is cannot be sure where his artistic independence ends and pleasing the corporations that support him begins? If the latter, then Sorkin might be identified with the desolate and deserted Mark Zuckerberg in the final scene of the ironically titled, The Social Network.